Growing up on a micro-farm in rural Washington, my dad Artie taught me the value of farm fresh and homegrown food. In the spirit of my dad, Artie's Harvest ensures you get the best local food the Pacific Northwest has to offer. That's why, at Artie's Harvest, we only partner with local farmers and growers who produce the highest quality crops right here in the Pacific Northwest. We don't just want local food to be a neat idea, we believe it should be a normal part of your everyday diet. We work to make that possible for you, the same way Artie did for our family. So go ahead, enjoy Artie's Harvest. 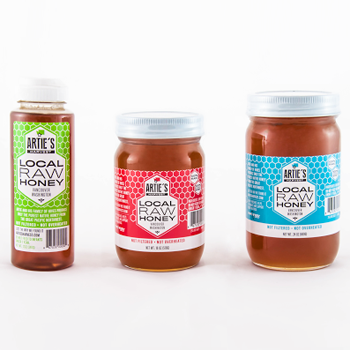 Artie and his family of hives produce only the purest native honey from the great Pacific Northwest. And since our honey is raw, never pasteurized, and never ultra-processed, it's good for you and good for the bees. Add this to yogurt, a favorite cup tea, or as a sugar substitute while baking. Artie's Harvest Local Raw Honey is so good! I love it's pure sweetness and yummy floral flavor. Artie's Harvest Local Raw Honey is perfect in your tea, on a English muffin, or on a bagel. Actually it has so many uses, so don't limit yourself. I actually enjoy it in my coffee or a quick spoonful when I'm craving something sweet. I love honey so it's no surprise that I love this honey but I can't get over how smooth and sweet it tastes. It's absolutely delicious! Find in stores at your local FredMeyer, Haggen Northwest Fresh and QFC Quality Food Centers! Follow Artie's Harvest on social media!